Imagine being a new golf instructor at your first big job. One of the first people who comes to your summer camp – and subsequently asks for a private lesson – is an energetic, competitive, 8-year-old boy named Jordan Spieth. When I met Jordan in the summer of 2002, he already was a natural athlete. He was also very mature and smart. But at that point in time, Jordan was unable to hit a draw. He was incredibly gifted and consistently hit the ball in the middle of the clubface, but he just couldn’t hit the ball from right to left like he wanted to. The issue was sway in his backswing, which is a common swing fault by golfers of all skill levels. During his backswing, Jordan allowed his hips to slide away from the target. It caused his right ankle to lose stability, and his hands got too high in his backswing. Again, these are common faults and they lead to a left-to-right (fade) shot shape. If you’re struggling to hit a draw – or if you’re losing too many shots high and to the right (for right-handed golfers) – then I have two tips and a drill to help you. Eliminating sway in the backswing requires more hip rotation away from the target. To achieve this, try flaring your back foot away from the ball somewhere between 10-45 degrees. How much you set the flare varies for everyone based on how their leg enters their hip socket. Start with your normal address position. Then keep turning your back foot away from the ball 1-6 inches until you reach a point where you feel quite a bit less resistance from your hips in your backswing. There is no right answer here. You’re looking to flare your back foot on an angle that feels best for you and enables your hips to turn the most. With more hip rotation and less sway, you’ll be able to swing on a more in-to-out path. That’s what Jordan needed to hit a draw. It’ll work for you, too. Another way to stop swaying off the ball is to let the knee on your back leg lengthen or straighten in your backswing. Many golfers try to keep their back knee flexed, but that limits hip turn and can lead to an over-the-top or outside-in swing path that contributes to pulls and slices. Instead, straighten out your back leg in your backswing. It will do wonders for your hip and shoulder turn. A good way to check your hip turn is to make backswings with an alignment rod tucked into your front belt loops. Start with your hips and alignment rod completely square to your target line. At the top of your backswing, check where the alignment rod points. For context, if the alignment rod points at the ball in the middle of your stance, that would be 90 degrees. We only need about 40-50 degrees of hip rotation. If you’re unable make 40-50 degrees of hip turn without rolling to the outside of your back foot, then you need to add rear foot flare, straighten your rear leg more or both. Keep working on your backswing with an alignment rod in your belt loops until you find the right amount of hip rotation that makes this move easier for you. From here, I instructed Jordan (who was a great baseball player, too) to swing out toward right field while he kept the clubface pointed closer to right-center field. With these changes to his backswing and swing path, Jordan started hitting a consistent draw. Finally, the last crucial piece to the puzzle is practice. Whether you’re a club champion or a 20-handicapper, purposeful time at the driving range will cement the ability to maximize your turn. Spend 5-10 minutes of every practice session working on your pivot and hip turn. 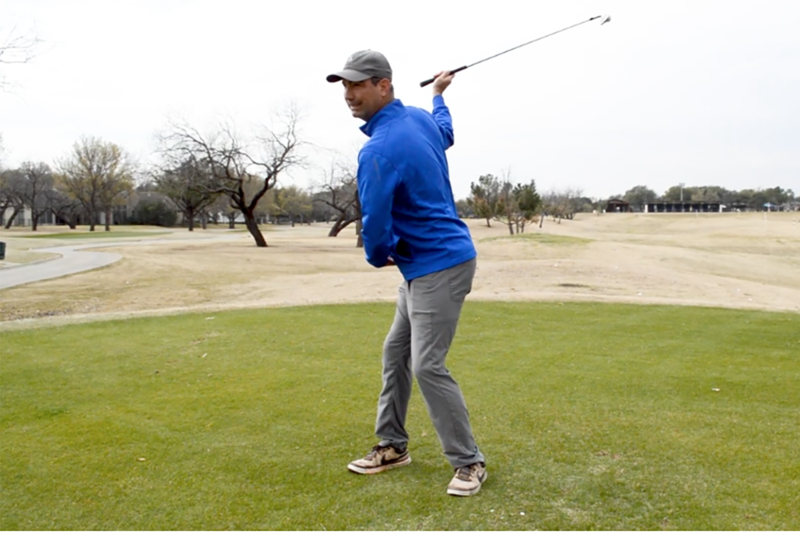 Making a more complete hip and shoulder turn will help you hit the ball much higher and farther. With a just a little investment in time, you’ll start hitting a draw. Just like Jordan Spieth. Joey Anders is a Class A PGA Teaching Professional at Brookhaven Country Club in Dallas. Among his many successful former and current students are three-time Major Champion Jordan Spieth and Julia Gregg, the runner-up at the 97th Women’s Texas Amateur Championship. To learn more about Joey or to schedule a private lesson, click here.